I recently switched from Tide liquid detergent, to Gain liquid detergent and I have been very pleased. I wanted a new detergent that would leave my clothes smelling great for longer then a day after washing. did not come out as vibrant. Gain does the whole job. It removes stains, keeps the color in my clothes and the smell in amazing (I use Original Fresh). 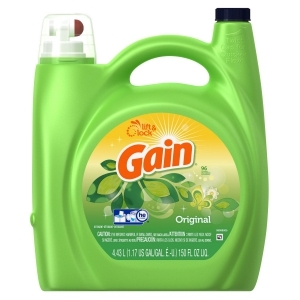 Whenever I do the laundry, I find the whole upstairs filled with the wonderful Gain aroma. as good as the day I washed them. Because of the fresh scent, I find that I use a little less then a full cap in one load of laundry. I also have very sensitive skin and have not experienced a problem. other brands (at least where I shop) but it is well worth the money. Like most household brands, I would suggest going to their website (Gainlaundry. com) and writing them a comment. I did this and was sent several valuable coupons. I would recommend Gain to anyone looking for an overall satisfying detergent.